Upon my election in April of 2012 I pulled up my sleeves and began to work. The first problem I wanted to fix was the town’s website which was outdated, featured stale content and hampered communication with our residents. I formed a sub-committee with former selectman Rich Gregorio to re-launch the website. I worked with our team to improve functionality and make the website more user friendly and relevant. Once we had the web site rebuilt, we could work to keep citizens informed on matters large and small. We were able to launch email alerts and we strive to make information more accessible. Next, I sought to give residents a more direct voice. I discovered a web-based tool called SeeClickFix. I formed a team with Selectman Ann Marie O’Neill to launch this tool, which gives residents an opportunity to report issues online and then follow their issue through to completion. Soon after, I saw that the City of Woburn had received a grant to implement a new program called Open Checkbook. I learned there was a second round of funding available that would allow new communities to use this too. Open Checkbook allows residents to access and view each and every financial transaction that takes place in the municipality. I worked with our Town Administrator and Town Accountant to win the grant for Stoneham to access the Open Checkbook program. As a result, at our most recent annual town meeting we had a 45 page budget available for review before the town voted on a $67,000,000 Budget. I continue to work to bring Stoneham current with today’s technology so that we will maintain our competitiveness in the future. Last year I worked on a sub-committee with Selectman Vallarelli with the goal of containing trash removal costs, which were spiraling out of control. Trash is contentious in any town and Stoneham was no different. Stoneham needed to reform its program and through hard work and compromise we were able to increase services by adding unlimited weekly recycling and save the town over $200,000 a year. A great byproduct of this initiative is promoting environmental conscientiousness by increasing recycling from 13% to approximately 25%. Further, we were able to reduce the trash fee from $260 a year to $150. I worked with our Town Attorney to have a home rule petition passed by the State House to put the trash fee directly into a revolving account so that the trash fee would only be used for trash and not funneled into our free cash account or used for any other purpose. Remember, my fellow Stoneham neighbors, we get the government we deserve on Election Day when we choose whether or not to vote. We deserve a Selectman that works in the best interests of our community. We deserve a leader that has gone above and beyond to fulfill his promises during his first term. We deserve the one candidate that has tirelessly worked to move Stoneham in the RIGHT direction. 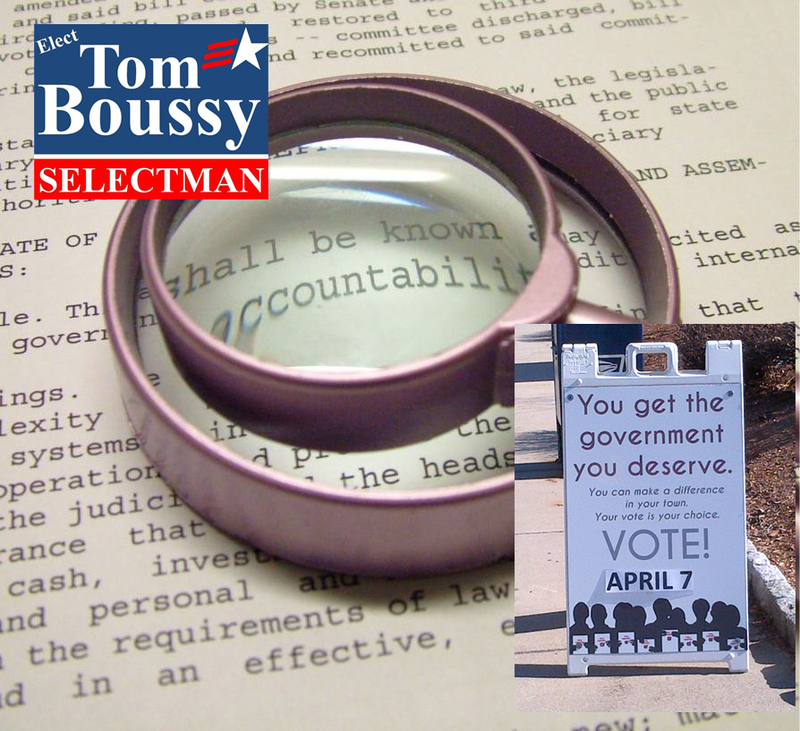 We deserve to re-elect Tom Boussy.